After a whirlwind week in Switzerland, team iW has narrowed down a few standout timepieces seen in the halls of Baselworld 2016. 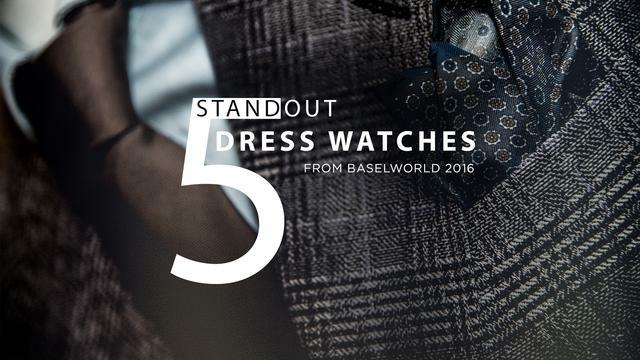 Today’s category focuses on some of the most stylish dress watches on the market. Although timepieces house various complications, what unites the models is their masculine style. Our memorable dress watches include models from Zenith, Omega, Chopard, BALL Watch and Glashütte Original. Continue reading for a closer look. The Omega Globemaster “Annual Calendar” begins its evolution with a new case diameter that has been increased from 39mm to 41mm. This new size allows for greater visibility of the “Pie Pan” dial that is already a renowned feature of the Globemaster series. The dial is also presented in a brand new lustrous shade of grey and reintroduces a classic cross design that is reminiscent of vintage Constellation models. The most prominent element of this update is the new movement that drives the Annual Calendar feature. It has been designed with an instantaneous jump, while on the dial, each month has been elegantly positioned between the blued indexes. The months are pointed to by a varnished blue hand. The polished hour and minute hands are blued and facetted. They are coated with Super-Luminova, along with the indexes. The case itself has been crafted from stainless steel and, similar to last year’s successful launch, the polished fluted bezel has been made with scratchproof tungsten carbide. Created in the true spirit of Omega, the Globemaster houses the brand’s most advanced mechanical movement and features a design inspired by early Constellation models. Ball Watch celebrates 125 years with this 40mm rose gold limited edition (125 pieces) addition to the Ball Watch Trainmaster series. The case has a diameter of 40mm and a height of 10mm. The handsome dress model features slim hour and second hands, date, Arabic 6 and 12 and very thin markers. Manufacture, inscribed on the dial, refers to the almost entirely revamped and upgraded ETA movement (Ball RRM1101). Still, even on the slim hands Ball adds its characteristic H₃ micro gas tubes to enable night reading. Shining with an entirely new movement, the Glashütte Original Senator Excellence features a power reserve of up to 100 hours, a first for Glashütte Original. The unusually high power reserve is achieved even though the Caliber 36 is fitted with only one spring barrel. The watchmakers achieved their goals by increasing the barrel’s diameter, shrinking the barrel arbor, and lengthening the mainspring. Via the caseback you’ll note familiar features like a characteristic Glashütte three-quarter plate, a skeletonized rotor, a refined stripe finish, perlage, blued screws and finely wrought decorations on the wheels and rotor track. But also visible is a newly engineered gear train that, with its open architecture, will perform its function with added visual élan at each manual winding. When it’s time for dress-up, the classic and minimalist design of the Zenith Elite 6150 fills the bill. With its 42 millimeter slim steel case, it fits perfectly with the thinner-is-in trend in watches. Measuring 9.4mm thick, it also features a transparent sapphire crystal caseback for a personal view of the new Elite 6150 automatic movement. The silver-toned dial is graced with rhodium-plated and faceted hands, and the hour markers are engraved and also rhodium plated. The Zenith Elite 6150 movement is just 3.92mm thick and features 195 components and 35 jewels. It beats at a frequency of 28,000 vibrations per hour, and it offers an amazing power reserve boasting a minimum of 100 hours. True to Zenith’s attention to detail, the oscillating weight is decorated with the Côtes de Genève motif. The watch comes on an elegant black alligator leather strap with rubber lining. The Chopard L.U.C XPS 1860 celebrates twenty years of the L.U.C collection as a reprised, slightly larger example of the first model, the L.U.C 1860. The 40mm L.U.C XPS 1860 comes in a choice of a steel-cased model or a limited edition rose gold model. Like the original, the new model remains an elegant, thin (7.2mm) and dressy design with a central hand-guilloché motif on the rose gold version and a sunburst satin-brushed pattern on the stainless steel version. Inside the gold model is Caliber L.U.C 96.01-L (with Poinçon de Genève quality hallmark), a caliber with a micro-rotor and 65-hour power reserve that was well ahead of its time when it debuted two decades ago. Inside the steel version Chopard places L.U.C 96.03-L.